Our gutter covers or leaf guard cover installation will help eliminate leaves and other organic material from collecting in your homes gutter system. 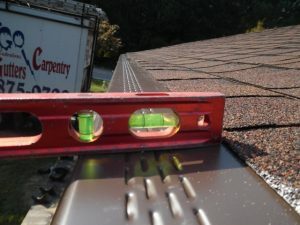 This gutter protection will reduce the number of clogs that can be found on a typical Raleigh home. By eliminating the collection of organic waste material, you are protecting your home from water damage caused by gutters not properly diverting water away from the walls and foundation. Our team takes great pride in creating custom solutions to meet our customers needs. Find out how we can deliver on our promise of completing your home project to your satisfaction. Contact Rain-Go Exteriors for Your Next Home Gutter Cover and Leave Guard Installation! Keep your gutters clean and free of leaves, pine needles and other debris by getting a professional, custom installed gutter cover or leaf guard. Our installers will complete your Raleigh gutter project that will help keep your home looking beautiful. Get a price from us by completing the contact form or calling 919-875-0700 to receive quality craftsmen work with quality materials and warranties for a reasonable price! Our seamless gutters are one piece gutters manufactured at your home. They are custom fit to your home. They are far superior than sectional gutters bought at your local home improvement stores. Our seamless gutters do not have in-line seams, which always fail, causing leaks. Our seamless gutters are made of a non-corrosive aluminum or copper and will last for many years. How are your gutters supported? Our seamless gutters are hung and supported by two key components. The first component is the hanger. For our seamless systems we use the RaytecTM floating hidden hanger that is recognized as the strongest gutter bracket on the market! It has been tested to withstand 297 pounds of pull pressure each! Don’t be fooled by the others who claim they have the strongest. Research it for yourself. This hanger is snapped into our seamless gutter and is used to support the weight of the gutter and the flowing water. The second component is the fastener. While a lot of companies use nails to hang their gutters (and claim this is the strongest), Rain-Go Exteriors uses only stainless steel inch and one half hex head screws to attach the gutters suspension system to your home! A screw is stronger than any nail, any day, and Rain-Go’s screws will not rust! Do you use high quality materials? 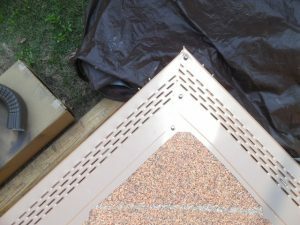 Can I choose different colors for the gutters? We have a variety of colors to match the color scheme of your home or business. In addition to copper gutters, some of the colors available are: White, Linen, Cameo, Almond, Wicker, Classic Cream, Sand Tone, Pebble Stone Clay, Dark Bronze, Terra Bronze, Black, Grey, Royal Brown, Musket Brown, and Evergreen. We can provide samples to show you when we meet with you to discuss your project. What type of warranty is given on workmanship? Rain-Go Exteriors Inc., is proud to offer a 10 year limited warranty. Please read the warranty details here. 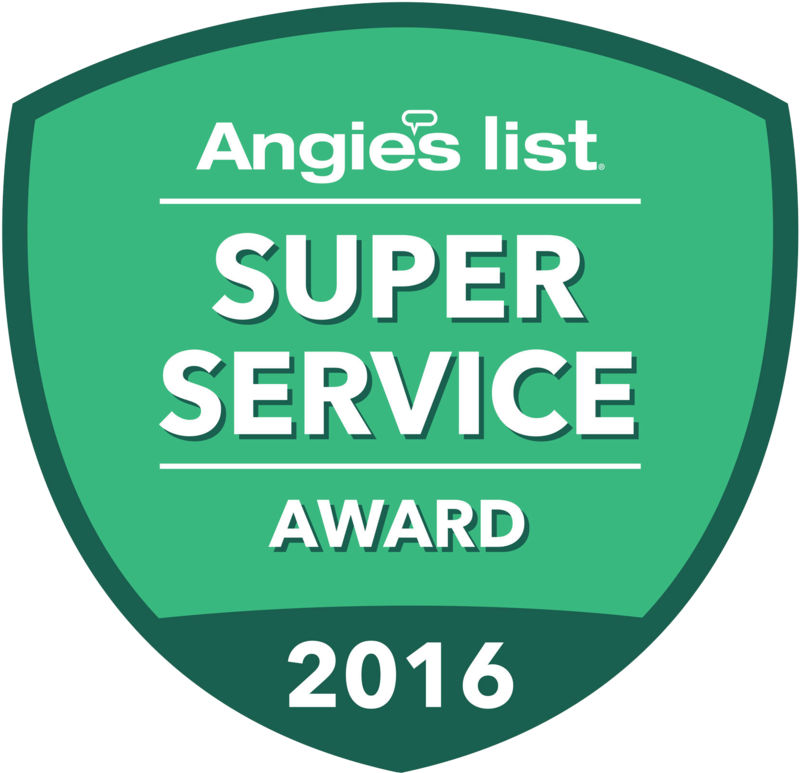 Does your gutter installation and service area cover my town? 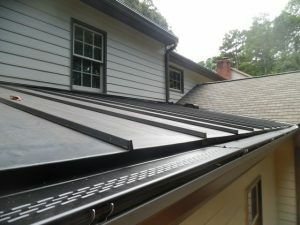 Rain-Go Exteriors Inc. provides custom seamless gutter design, installation, and services to most of the Triangle and surrounding area. See ourLocations page for more information on our wide area of service coverage. Chances are, you are in our service area! “Rain-Go installed gutters and down spouts on my newly constructed home. We called Rain-Go a few months back, and Tim came out and gave us a quote. We got a 2nd quote from a well known national hardware retailer that shall remain nameless. The 2nd quote was a few hundred dollars more, and used materials of lesser quality. To make things even better for Rain-Go, the 2nd quote came with a 1 year warranty on parts and labor, while Rain-Go offers a 10 year warranty on workmanship and a 20 year warranty on materials. Anyway, the written quote then found a nice comfy spot on a shelf and stayed there awhile. When we called Rain-Go again a few months later, Susan didn’t mind that the original quote was only good for 30 days, she said they would be more than happy to honor it nonetheless. So then after a few rain delays and scheduling conflicts, we were able to get things done. On the morning of the installation day, I saw a truck pulling an enclosed trailer behind it, emblazoned with “Rain-Go” on the sides, and two men came to the door. Our installers were Steve and Jeremy, and once proper introductions were in place, they went right to work. The two of them worked in tandem, in an impressively efficient manner. If they ever took a break, you’d have hardly known it. They did a very good job, the quality of their work was evident in not just the finished product, but was also displayed in the way they did the work. Call us today at (919) 875-0700 or fill out the form for a free quote on your gutter installation! Hire the Right Contractor the First Time! What Makes Rain-Go Exteriors Gutter Installation Different?